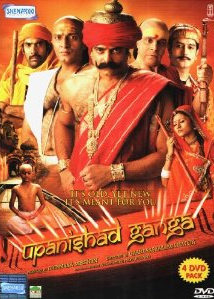 Episode #2 of Hindi TV Serial Upanishad Ganga is titled as Knowledge, Transforms (in Hindi the title is Gyan Laye Parivartan. We often heard that Knowledge is the power and that is why the episode is started with the precious words – हिरण्यमयेन पात्रेण सत्यस्यापिहितं मुखम्। तत्त्वं पुषन्नपावृणु सत्य धर्माय दृष्टये॥ Meaning: O Sun God, The Golden Vessel has concealed the Truth within, open it for me so I can explore it! Exploring the story of Ratnakar his wife Ratnavali and Sage Narad (aka Devarshi Narada), this episode explores the bitter truth of life and society. Ultimately all relations are based on some kind of selfishness and there comes a point when a person start thinking about his/her own interest rather than the other. You are responsible for your deeds and no one else will take responsibility from your shoulders. So be careful of your actions, always. We often heard people saying that why it matters that what happens after the death? Also why we think that there are heaven and hell? Who knows that it really exist? Does thinking of after-life and avoid enjoying the material happiness in the current life isn’t wrong approach? Isn’t it a way of escape? Escape from the truth, the facts, the actual life we live? Probably the philosophy of afterlife could came to existence due to the following reasons. We know that punishment, prison, fear cannot prevent crime from being happen, why? Because till one do not consider his actions are wrong, he will not hesitate doing it. The wrong doings can be prevented only by the proper attitude of everyone in the society. This happens to all the aspects, not only wrong doings. For example, you can ask a child to read a book, and you can force him to take a book and read. But you cannot control his mental state. His eyes might be in the book but his mind might be anywhere else. He may be reading but not absorbing! What difference it make then whether he read it or not? So unless and until, one firmly believe in his actions and know the importance of what he is doing, he may not be doing it properly. And only the Karta, the person who does the thing, knows what he is doing. We can hide the truth from the others but not from ourselves. So, if the Karta himself can watch and analyze his own actions neutrally, he himself can control it. That is why it is said that You are your own friend and you yourself are your enemy too. Ratnakar was a dacoit, people were feared from. In the dark nights in deep jungle he used to loot the travelers passing through. He and his gang then distribute the stuff amongst them. Ratnakar strictly ordered them to not to spend the earned stuff at brothels. He himself was a soldier of a king in past. Once he killed the other soldiers who did wrong stuff. Thus he enrolled in the hit-list of the king and considered as rebel. He was deported from the King’s territory, and he, who thought, he didn’t anything wrong, declared a kind of war against the king. His philosophical questions about Paap and Punya leads us to think the definition of Right and Wrong. The most powerful dialogs of the episode are told by Narad to Ratnakar when he came back from his home. The dialogs clarifies and explains the philosophy of considering one himself as his own friend and enemy. The scenes where we see Narad (K. K. Raina) singing chants or Shlokas, looks fake. As the lips movement are not in sync with the chants sung by the singer. It is a downside of the episode we can say. There are scenes which do not represent the play running in the theater, but the characters are still speak in the manner as they were speaking from stage! May be director’s vision is to keep continuity in actors’ performance here. Also the actor playing narrator in this episode is not convincing. The episode belongs to Zakir, Jaya and K. K. Raina in terms of role length. (For example see Zakir’s body language when Ratnakar challenge Narad and went to his home for getting answer of his queries; and compare it with – when he came back from home). They perform really well to make the episode effective. The background sound is really in sync with the events. The wardrobe, the sets and the locales are perfect. Most of the dialogs are very effective and present the essence of life. Some, one liners are not so effective (for example the Q/A session of Ratnakar with his family). The DVD quality is good and it brings the fantastic content which matters the most. Our personal verdict is, one shouldn’t miss this TV Serial, which is an attempt to look at the dramatized version of some of the ancient documents which are the vault of knowledge and wit. Are you going to watch this TV Serial? What you think about this episode? What are your thoughts about Ratnakar’s tale? And yes, we know Ratnakar with the different name… What is that? If you find this review helpful in making your buying decision (or decision to spend your time to watch it), do not forget to share it with your friends and family via various social networks like Facebook, Google+, and others.